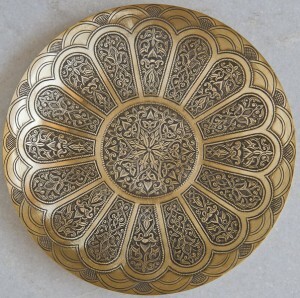 There is no stencil used for the design: it is made manually using a hammer and chisel. The overall design is divided into eight parts in order to make the complete pattern as consistent as possible. At first the design is done on one of the eight parts and then copied onto the other seven parts using carbon paper. After the full design is completed, it is then carved to a depth of 0.5mm with a metal pencil. The platter is then smeared with acid and fired, after which it becomes black. It is then cleaned with emery paper, resulting in the black color remaining in the carved areas and the design standing out dramatically. 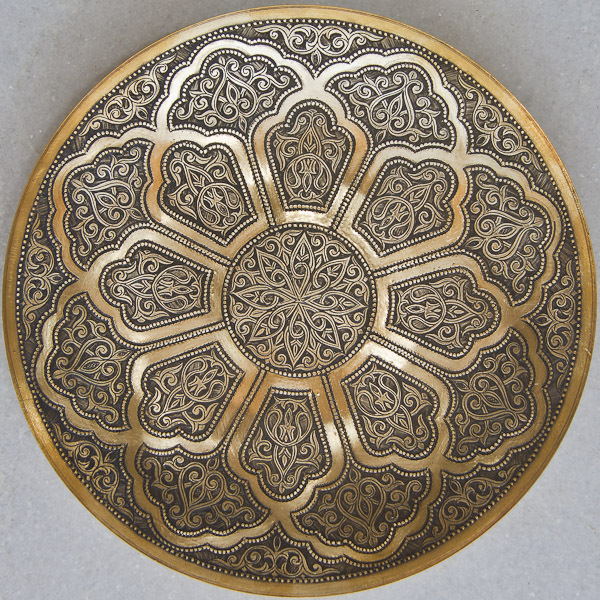 Carving, firing and cleaning is repeated two or three times depending on the intricacy of the design. Lacquering is the final stage in the process. Perfect for display on your wall, or as a table centre-piece, and with a great story of traditional craftsmanship behind them. If you are interested in purchasing one then please contact us for prices. This entry was posted in Craft Heritage, Uzbekistan and tagged artisans, brass, bukhara, products, sale. Bookmark the permalink. Both comments and trackbacks are currently closed.